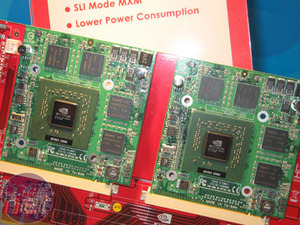 In a move that appeared to catch even NVIDIA's PR staff off guard, MSI have displayed an innovative new PCI-Express graphics card here at CES 2006. Dubbed the Geminium-Go! this card features two 6600-class GPUs on the same board. Big deal, you might say - ASUS have had dual 7800GTs on their Extreme N7800GT DUAL/2DHTV for a while now. The real reason the Geminium-Go! is causing such a stir is because MSI have used twin notebook MXM graphics daughterboards instead of hard-wired chips. This has the effect of creating what MSI claim is the World's First Upgradeable graphics card. As the theory goes, one might buy this dual Go6600 card to start with, and upgrade later to a pair of the more powerful Go7800 series down the road. We cornered a MSI staff member on the stand to ask the obvious question: just why have they created this product? At trade shows, looks can often be deceiving and there is some fineprint to work through with this card. Anyone excited by the prospect of single-card, single-slot SLI will be disappointed: we believe these modules will still require heatsink / fan cooling, and you can clearly see the four mounting holes in the photos below. In fact, the use of MXM slots means the daughterboards sit several millimetres above the main PCB, so even with slimline coolers, this is still a dual-slot card at best. When we quizzed several NVIDIA PR staff about the technicalities of this product, they appeared to be unaware of its existance. However, we later found out why the suggestion of using two MXM cards in SLI didn't shock them: SLI is coming to notebooks! Bringing their substantial investment in SLI to notebook gaming was a natural extension of their desktop branding, we were told, and in fact it was mentioned so casually it was as if we should have already guessed that this was NVIDIA's next move. I don't know about you guys, but I reckon having just one 7800 GTX in a laptop is special enough. The idea of two 7800 GTXs is just staggering. Then again, after Quad SLI, who knows what they'll do next! Digital Reviews reports that such notebooks will sport twin cooling systems: one for CPU, RAM and general system cooling as per normal, and an additional side-to-side flow-through cooling channel to chill the MXM modules. We aren't aware of notebook partners' plans at this point, but whatever the cooling solution, it's unlikely to be quiet. Performance is rumoured to be understandbly quick at 11,000 3DMarks or more. Naturally, we will be putting it through our Real World Gaming tests just as soon as we receive a test sample and that may not be that far away. While NVIDIA don't comment on unannounced products, the whisper is that we could see these systems as soon as late-February / early March. Unfortunately, we can't show you photos of the notebook SLI today: it was shown to us behind closed doors. 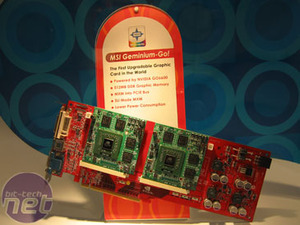 But we do have some photos of MSI's Geminium-Go! and from that, it isn't hard to imagine what the notebook motherboard might look like. We want your thoughts on these two controversial new products. Are you tempted by the low-voltage, low noise SLI? Does the idea of Go7800 GTX SLI further tempt you to switch to a gaming notebook for LAN party action? Dive into our Discussion Forums and let your opinion be heard.